2015 is an excellent vintage for the Côtes de Bordeaux. I was especially impressed with Castillon and Francs this year, but there are also many very good wines to be had from Blaye, Cadillac, Sainte Foy and Bourg. There are seductive fruit tones to the reds, some on the voluptuous spectrum, others with more minerality. The ripeness is high [as are the alcohols] but there is also freshness too. 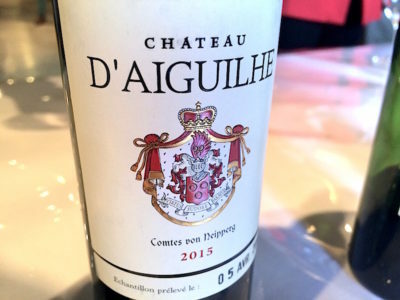 Without doubt these appellations will provide some great bargains for the Bordeaux enthusiast. There are many excellent wines that are of grand cru classé quality but that will be without that price ticket. I will be looking to the Côtes de Bordeaux first for my own cellar in Bordeaux 2015s – and Castillon and Francs particularly. Top of the tree are the usual over-achievers in Castillon: Château d’Aiguilhe, Château Alcée and Clos Lunelles. All three are contrasting, partly due to terroir, partly through vineyard and winemaking approach. There are impressive efforts too from Château Ampélia, Château Côte Montpezat, Château Veyry and Clos Puy Arnaud. In Francs I was impressed Château de Francs, “Les Cerisiers”, Château Puygueraud and Château La Prade. 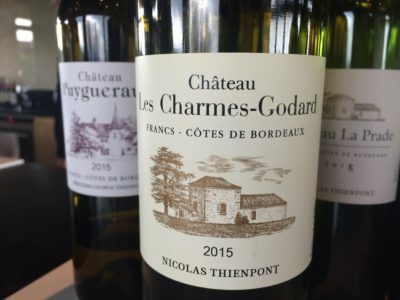 In Cadillac very good wines have been made at Château Clos Chaumont and Château Reynon, and in Sainte Foy, Château Hostens-Picant and Lucullus look good, the latter is especially bold. A few words about the growing season in 2015. David Suire and Cyrille Thienpont at Nicolas Thienpont, St Emilion consultants and owners of properties in Castillon and Francs, describe almost perfect conditions for flowering in first fifteen days of June. Very hot weather continued in the region until the end of July. There was some water stress on the limestone-clay terroirs and the grapes developed thick skins. Wetter and cooler weather arrived in late July and continued into August. This rain helped veraision [the colour change in the grapes], allowing it to be as quick and even as the earlier flowering period. The cooler August conditions then continued into September. The first half of the month was cool and cloudy but largely dry and conditions gradually warmed up. They report a rather slow development in skin ripening which necessitated a plot by plot approach to picking. August rain apart, they see 2015 as a very dry vintage on the Right Bank in terms of the water balance, the equation between rain input versus vine transpiration and evaporation. Overall they are very excited by the quality of 2015. Likewise Vignobles Comtes von Neipperg described a similarly ideal growing season. Flowering occurred in excellent conditions, which was followed by an unbroken dry spell from mid June to the end of July. Organic practices are now applied at their Castillon property d’Aiguilhe [though the property is not yet organic certificated]. These approaches have led to harvests where the physiological maturity and phenolic maturity of the grapes are more in sync and where the harvests are earlier. At Château d’Aiguilhe the harvest began with the Merlot on 23rd September and finished with the Cabernet Franc on 8th October, 2015. The following wines, listed in alphabetical order, were tasted mostly blind at the Grand Cercle event held at Château Bellefont-Belcier on Sunday 3rd April. Several other properties were tasted with Nicolas Thienpont at Château Pavie-Macquin, Vignobles Comtes von Neipperg at Château Canon-la-Gaffelière and Vignobles Perse at Château Pavie.